Decorative Life: Flowers 10-12 days, foliage 5-8 days. Harvest when flowers are fully open. Plants should be grown in full sunlight for maximum quality. Cold storage intensifies flower color. 34-38 degrees F.
E. amethystinum is also used for cut flowers. 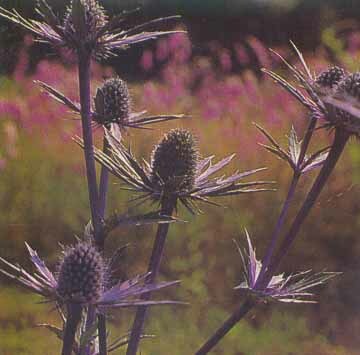 Eryngium is a Greek name for some sort of thistle. The specific epithet name “planum” means flat.